Little did I know, when I asked Jeremy to pass on the ground beef this time around, that he would bring home infinitely more interesting proteins instead: jumbo tiger prawns and tri-tip steaks. These made for some seriously fancy weeknight dinners, despite a relatively small time commitment. Since shellfish doesn’t keep, we kicked things off with the prawns, which, as U-15s, were easily the largest shrimp I have ever cooked with. I wanted to do them justice, and I can think of no better way to elevate shrimp than to drench them in butter, garlic, white wine, and lemon juice. The recipe I chose had more steps than I would have guessed for such a simple concept—toasting breadcrumbs, searing the shrimp on one side only, building the sauce in several layers, and finally simmering the shrimp to finish cooking through—but it only required the use of one skillet, and I can’t argue with the results: perfectly cooked shrimp in a flavorful sauce with just the right hint of body. I served them over mashed potatoes, but Jeremy ended up standing in front of the stove, eating the last few prawns right out of the pan. The only place I strayed from the recipe was choosing to make fresh shrimp stock for the sauce instead of bottled clam juice. When I sit down to eat, I don’t want to mess with shrimp shells, since the mess on my hands and the prospect of shell bits in my food sets off my tactile alarms. 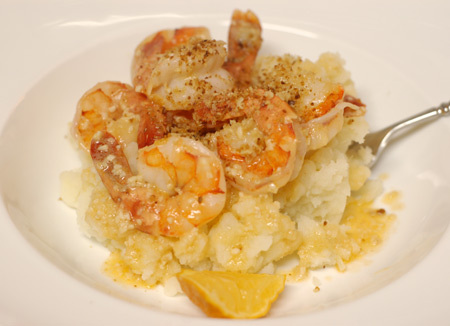 But the shells can easily be used to make a flavorful shrimp stock in just a few minutes’ time. Just toast them in a saucepan until they turn pink, then throw in some celery, onion, garlic, peppercorns and salt, maybe some fresh herbs, and a dollop of tomato paste or powder; cover the lot with water and let it simmer for 20 minutes, and you’re golden—better, and infinitely fresher, flavor than clam juice. I like to freeze it in 1-cup portions for just this sort of occasion, but if you don’t feel like making shrimp stock at the time or don’t have enough shells to make a batch, just freeze the shells in a little Ziploc for the next time. 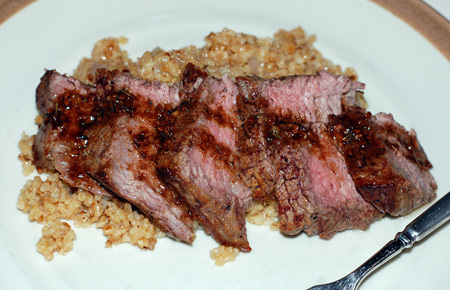 Last night’s dinner was pan-seared tri-tip steaks with a red wine pan sauce over a toasted bulgur pilaf. Tri-tip is apparently a difficult cut to find in some parts of the country, but we pick it up every so often as an affordable, tender, and incredibly flavorful cut. Our steaks were a little oddly shaped, but they were nice and thick, and I seasoned them with just salt and pepper before searing them in a cast-iron skillet and chucking them in a 400F oven for 15 minutes. While they finished cooking to a perfect medium and rested, I toasted bulgur wheat in a bit of chicken fat with some onions and let it cook down with homemade chicken stock, then made a pan sauce in the cast iron skillet with red wine, minced garlic, dried thyme, a pinch of sugar, and several pats of butter. A balsamic-yogurt dressed salad rounded out the meal. Honestly, this felt like a special-occasion dinner, not an ordinary Tuesday night. Nolan surprised me by devouring fully half of my steak, the first red meat he has eaten in several months, I believe. To make the meal feel even more special, we had a New York cheesecake waiting patiently in the refrigerator. Jeremy has been wanting me to make a cheesecake since his birthday, and we finally had all the ingredients on hand. I swear by the Juniors book these days: their cheesecakes aren’t light by any means, but the flavor and texture is sublime, and every time I make one, it turns out perfectly. This time we went basic—an unadorned vanilla cheesecake with their classic sponge cake crust. And all I can say is, GO BAKE THIS NOW. It isn’t hard to do and it tastes like heaven. If the prospect of a whole cheesecake sitting in your refrigerator scares you, portion it into slices, wrap them in parchment, and freeze them for later. Now go buy cream cheese already! Preheat the oven to 350F and generously butter the sides and bottom of a 9″ springform pan. If you are concerned about your springform leaking, wrap the outside with aluminum foil all around the bottom and up the sides. In a small bowl, sift together the flour, baking powder, and salt. Beat the egg yolks in a large bowl on high speed for 3 minutes. With the mixer running, slowly add 2 T granulated sugar and beat until the yolks turn pale yellow and form thick ribbons when you lift the beater, about 5 minutes more. Beat in the extracts. Sift the flour mixture over the batter and stir it in by hand, just until no more white flecks appear; then stir in the melted butter. In a second and very clean bowl, beat the egg whites together with the cream of tartar on high speed until frothy. Gradually add the remaining granulated sugar and continue to beat until stiff, glossy peaks form. Use a spatula to fold about 1/3 of the egg whites into the batter to lighten it; then fold in the remaining whites as gently as possible. Spread the batter gently and evenly over the prepared springform and bake just until golden and set, about 10 minutes; a finished cake will spring back when touched lightly in the center. Place on a wire rack to cool while you prepare the cheesecake batter, and leave the oven on. Place one package of cream cheese, 1/3 C sugar and the cornstarch in a large mixing bowl and beat on low until creamy, about 3 minutes, scraping down the sides. Blend in the remaining cream cheese one package at a time. Then increase the mixer speed to medium and beat in the remaining sugar, vanilla, then the eggs, one at a time. Finally, beat in the cream just until completely blended; scrape down the sides of the bowl several times during this process. Gently pour the batter over the sponge cake crust in the springform. Place the springform in a large shallow pan filled with hot water that comes up the sides of the pan about 1″. Bake until the top of the cake is slightly golden tan, about 1.25-1.5 hours. It will have risen somewhat, and the center of the cake will still look wobbly, but have faith. Remove the pan from the water bath, transfer to a wire rack, and let cool for 2 hours at room temperature without touching it. Then cover the entire pan loosely with plastic wrap, and refrigerate until completely cold, preferably overnight but for at least 4 hours. 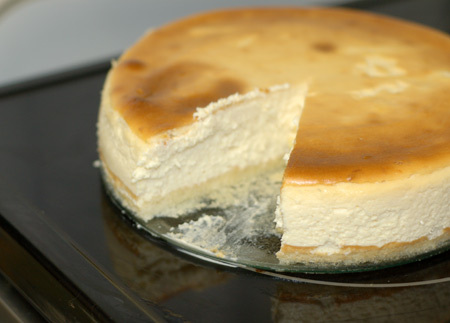 To serve, remove the sides of the springform and slice into the cold cheesecake with a straight-edged knife. It doesn’t need any garnishes, but pile on practically anything if you like–fruit, ganache, whipped cream, etc. Source: Junior’s Cheesecake Cookbook, by Alan Rosen and Beth Allen (pp. 17, 34-36). Update 2/3/14: I made a gluten-free version of this cheesecake for Jeremy’s birthday this year; it could be made grain-free with the substitution of arrowroot for organic cornstarch. To modify the sponge cake crust, I substituted 2/3 C almond flour (I used Bob’s Red Mill, which is more like almond meal, because that is what I had) for the cake flour. I also reduced the baking powder to 1/2 tsp for altitude, and omitted the cream of tartar because I don’t find it necessary. I was very pleased with the outcome of the grain-free base layer–it took a few extra minutes of baking time, but was virtually indistinguishable from the original recipe otherwise, and didn’t leave the birthday boy feeling deprived! Update 10/22/14: Cheesecake was sounding good for my birthday as well, so I went ahead with a plain grain-free cheesecake even though I only had two packages of cream cheese; I ended up halving the filling recipe and baking for 45 minutes. Gosh I love cheesecake. Any style – not just NY. My favorite way to serve it is with cherries on top. You know, it really isn’t difficult to make. The only reason I can think of, why I don’t make it more often is because I’d end up eating the entire cake. Great recipes — I love Junior’s cheesecake! They are so rich, I only eat a couple of bites though 😉 This would be good for a party.